I’ve chosen a classic white woolen yarn for my angel’s robe and a demure pale green for the wings. If you’ve stumbled across something with a bit of texture or sparkle, you might want to dress him in something a little more outrageous. 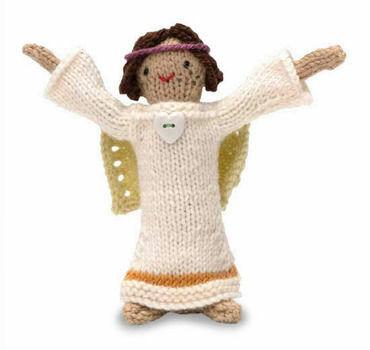 The same doll, or a similar version of it, can be used both for the angel who appears before the shepherds and for Angel Gabriel. Doll Using the dark beige yarn, knit, make up, and stuff the basic figure. Using the black yarn, make two French knots for the eyes. Untwist a short piece of red yarn into two even strands. Using one of the strands, embroider a “V” shape for the mouth. For the hair, use the crochet hook and dark brown yarn to crochet two chains, each 14 in (35 cm) long (see page 19). Arrange the first chain in four even-sized loops and secure these to one side of the head. Do the same with the second cord, securing it to the other side of the head. Dress Make two identical pieces for the front and back. The dress pieces are knitted from the bottom to the top (neck) edge. Cast on 22 sts in white. K 4 rows. Join dark yellow yarn and work 2 rows in st st, beg with a K row. Break yarn and continue working in white yarn. Work 2 rows st st, beg with a K row. Next row: K2, k2tog, K to last 4 sts, ssk, K2. Next row: P. Repeat last 2 rows three times more. [14 sts] Work 16 rows in st st, beg with a K row. Mark beg and end of last row with a piece of contrasting yarn or thread. Work 5 rows in st st, beg with a K row. K 3 rows. Bind off loosely. Seam the dress pieces together 2 sts along at each side of the neck opening and join the shoulder seams. For the sleeves, spread the two dress pieces apart. With the right side of your work facing you, pick up and K 14 sts between the two thread markers on one side of the dress. Work 9 rows in st st, beg with a P row. Next row: K2, m1, K to last 2 sts, m1, K2. Next row: P. Repeat last 2 rows three times more. [22 sts] Bind off loosely. Complete the second sleeve in exactly the same way. Remove the thread markers. To make up, join the underarm and side seams. Sew the button in place using bright green thread. Wings Make two identical pieces. Cast on 8 sts in pale green. K 2 rows. Next row: K2, (m1, K2) 3 times. [11 sts] Work 3 rows st st, beg with a P row. Next row: (K2, m1) 5 times, K1. [16 sts] Next row: P. Next row: K2, (yfwd, k2tog) 6 times, K2. Next row: P. K 2 rows. Bind off loosely. Sew the wings to the back of the doll once the dress is in place. The right side of the wings should face the back of the doll so that you see the wings’ right side when you look at the doll from the front. Hairband For the hairband, use the crochet hook and purple yarn to crochet a chain 71/2 in (19 cm) long. Wrap the hairband around the angel’s head and tie in a knot. Basic Standing doll You will need to knit either a standing or a traditional-style doll (see pages 22–3) to create each of the adult figures in the book: Mary, Joseph, the Angel, the two Shepherds, and the three Wise Men. The body of the Basic Standing Doll is bottle shaped, which enables the doll to stand up independently. The Traditional Doll has separate legs and so is less suited as a character in a Knitivity scene. For this reason, all the dolls shown in this book have been knitted as standing dolls, except for one version of Mary (shown on page 24). However, it is really up to you whether you knit your dolls as standing or traditional-style dolls— or perhaps a mix of the two. The clothes for all the characters are designed to fit both basic shapes. The standing doll is approximately 6 in (15 cm) tall. You will need For the doll ¾ oz (20 g) of DK yarn (the particular shade is given in the instructions for each individual doll) ½ oz (15 g) of polyester toy stuffing Equipment A pair of size 2/3 (3 mm) knitting needles A yarn needle to sew the doll together Front The front of the doll is worked as one piece, from the tip of the feet to the top of the head. Cast on 5 sts for the first foot. Work 6 rows in st st, beg with a K row. Break yarn and leave sts on the needle. On the same needle, cast on 5 sts for the second foot. Work 6 rows in st st on these sts only, beg with a K row. * Next row: K5 sts across second foot, cast on 5 sts, K5 sts across first foot. [15 sts] Next row: P. ** Work 8 rows in st st, beg with a K row. *** Next row: K1, k2tog, K to last 3 sts, ssk, K1. [13 sts] Work 7 rows in st st, beg with a P row. Next row: K1, k2tog, K to last 3 sts, ssk, K1. [11 sts] Work 23 rows in st st, beg with a P row. Next row: K1, k2tog, K to last 3 sts, ssk, K1. [9 sts] Next row: P. Next row: K2, m1, K1, m1, K to last 3 sts, m1, K1, m1, K2. Next row: P. Repeat last 2 rows once more. [17 sts] Next row: K2, m1, K to last 2 sts, m1, K2. [19 sts] Next row: P. Next row: k2tog, K2, (k2tog) twice, K3, (ssk) twice, K2, ssk. [13 sts] Next row: p2tog, P to last 2 sts, p2tog. [11 sts] Next row: (k2tog) twice, k3, (ssk) twice. [7 sts] Next row: p2tog, P3, p2tog. Bind off remaining 5 sts firmly. Back The back of the doll is worked as one piece, from the base to the top of the head. Cast on 15 sts. Work 2 rows in st st, beg with a K row. Continue as front from ** to end. Base Cast on 5 sts for the first foot. Work 6 rows in st st, beg with a K row. Break yarn and leave sts on the needle. On the same needle, cast on 5 sts for the second foot. Work 6 rows in st st on these sts only, beg with a K row. * Next row: K5 sts across second foot, cast on 3 sts, K5 sts across first foot. [13 sts] Work 5 rows in st st, beg with a P row. Next row: k2tog, K to last 2 sts, ssk. Next row: P. Repeat last 2 rows once more. [9 sts] Next row: k2tog, K to last 2 sts, ssk. Next row: p2tog, P to last 2 sts, p2tog. Bind off remaining 5 sts. Arms Make two identical pieces. Each arm is knitted as one piece from the top of the arm to the tip of the hand. Cast on 7 sts. Work 24 rows in st st, beg with a K row. Next row: K1, k2tog, K1, ssk, K1. [5 sts] Bind off pwise. To make up the basic standing doll Join the doll pieces at the sides and around the head. Stuff the doll, using a small piece of stuffing at a time. Don’t stuff the doll too firmly—it should feel fairly squashy. Place the feet of the base and the feet of the doll front right sides together and seam around the edges using back stitch (see page 17). Turn the feet the right way out so that the base is in its final position. Join the remainder of the base to the main part of the doll by taking your yarn under a loop near the edge of the base and then under a horizontal loop on the first row of the main part of the doll. This technique is similar to mattress stitch (see page 17) and will form a neat, professional finish. Seam the long edges of the arms together using mattress stitch and oversew the arm tops in place at either side of the body so that the tops of the arms are about 3⁄8 in (1 cm) below the doll’s neck.